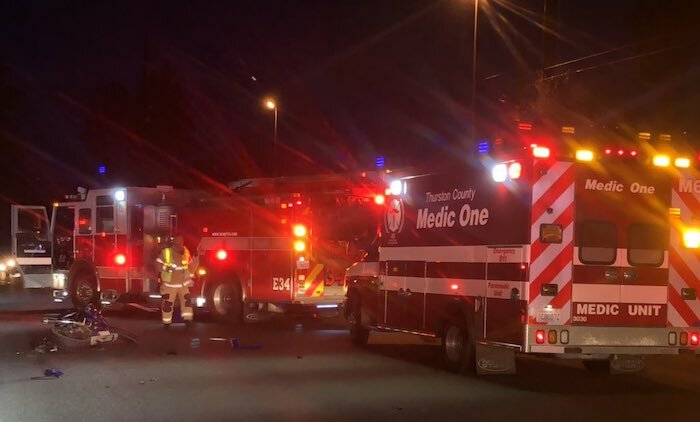 A motorcyclist was killed in a collision with a suspected DUI driver on State Route 510 in Lacey on Tuesday night, according to the Washington State Patrol. The incident occurred around 10:20 p.m. on SR 510 (Pacific Ave SE) at Rockcress Drive SE. Police say a 36-year-old Lacey man was heading east on SR 510 in a Mazda as the motorcyclist was heading west on a Yamaha. The Mazda went to turn left and cut in front of the motorcycle, causing the crash. The motorcyclist, a 33-year-old Olympia man, was killed. The DUI driver had three children in the car at the time of the wreck. One of the children, an 8-year-old boy, suffered injuries. The driver and the other two children were not hurt. Police say the causing driver was arrested for investigation of vehicular homicide, vehicular assault, DUI and three counts of reckless endangerment — one count for each child. SR 510 at Rockcress Drive SE was closed at the scene for 3.5 hours after the crash for the cleanup and investigation. The causes of motorcycle accidents in Washington state are very similar to the causes that trigger automobile accidents, only the damages are much more severe. The difference lies in the lack of protection that exists for riders versus those who travel in cars, trucks, or SUVS. If someone you know has been killed in a motorcycle crash, it is important to find a wrongful death attorney who understands the lifestyle of motorcyclists and the laws that apply to these cases. 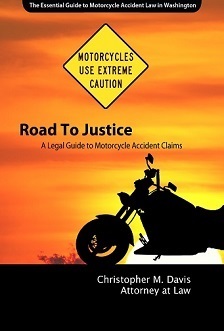 There are unique challenges involved, and only an experienced attorney with a history of handling motorcycle accident claims should be on the case. In order to prove wrongful death, your attorney must prove that the death was a result of the negligence, recklessness or carelessness of another individual. Most motorcycle fatalities are linked to the negligent behavior of another driver on the road. Surviving family members may pursue civil justice in Washington state be filing a wrongful death claim, which covers spouses, children, parents, siblings, and some financial dependents. Damages may include medical bills and lost wages that the victim might have earned over their lifetime. Family may also recover damages for pain and suffering, loss of companionship, and funeral costs. The attorneys at Davis Law Group are committed to helping family members recover compensation after a loved one has been killed in a motorcycle accident. Regardless of the nature of the crash, if it was caused because of someone else’s negligence, contact us today at (206) 727-4000 for a free consultation.